A weekly or so (for now) rambling about whatever happens to be on my mind. I had planned to join a group of cachers on Saturday for a foray into Pennsylvania. Our primary targets were a couple of special caches, Raiders of the Lost Cache (GC2HN2H) by mikehoffman and Centralia, The Burning Town (GCPK46) by MickEMT. I've wanted to visit Centralia for years. It is a largely abandoned town due to underground mine fires that started in 1962. However, because of the snow that came through late last week and dumped close to 2 feet of snow in that part of Pennsylvania, the trip had to be cancelled. I had hoped to make Raiders my 4000th Groundspeak cache find, so I had to think of another special cache to mark the milestone. After picking up a few local caches on Saturday and after church on Sunday, I was able to finally hit #4000. I decided to use Military Intelligence, Then and Now by Nighthawk700. It was special for a few reasons. First, it was created just for me as one of Groundspeak's I <3 Geocaching Lab Cache program. These are an experimental cache type that Groundspeak allowed each Premium Member to create one this month that could be found one just one other player. I worked with both Nighthawk700 and globaltreckers to each create and find one of these caches. The area was also special since it was the first stage of my 200th cache find, They Served in Silence (GCQVMJ) by dragonsear, and the National Vigilance Park. From the NVP website: Dedicated on 2 September 1997, National Vigilance Park and its Aerial Reconnaissance Memorial stands to honor those "silent warriors" who risked, and often lost, their lives performing airborne signals intelligence missions during the Cold War. The backdrop for the park is a semicircle of trees, each representing the various types of aircraft downed during U.S. aerial reconnaissance missions. I was also off Monday for Washington's Birthday (AKA Presidents' Day) and had a great day caching with my friend Charlie (sfcchaz). We were primarily after a few TerraCaching hides, but also got in some GeoPoker, GeoDashing and even a couple Groundspeak caches. After we each grabbed a new card in our poker game, our first stop was Maryland's First State House (TCE6R), a virtual cache by ziawoods in St. Mary's City. 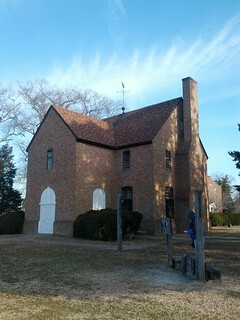 The original building was completed in 1676, and the Maryland Assembly and the courts of law of the colony met here for twenty years until the capital was moved to Annapolis. The first floor of the building is one large chamber for gatherings of the Assembly and the Provincial Court. After the capital moved, the building was used as the County Court building, then for more than a century starting in 1708, as the meeting place of the local Anglican Parish. The original building was demolished in 1839, and rebuilt in 1934 as part of the celebration of the 300th anniversary of the founding of Maryland. Despite having been right by here before and having parked in the same lot and walked right past the building, I hadn't realized what it was. That's what I love about geocaching (well, one of the things). You're always discovering something new, no matter how familiar you think you are with an area. From a "big example" of state history to something much smaller and out of the way, our next stop was Historic Drayden Schoolhouse (TCEMK), also by ziawoods. 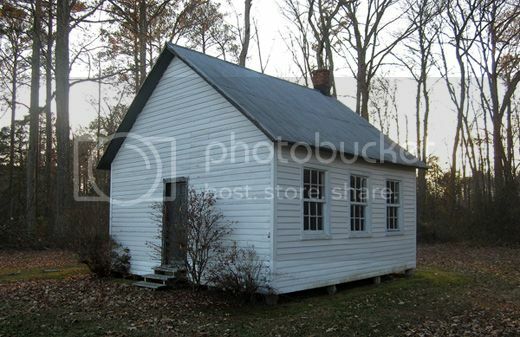 [It is] one of the earliest extant schoolhouses for the teaching of African American children in Southern Maryland. [It] was built on land donated in 1889...first holding classes in 1890...[and] was one of only three in this district. Up to forty students attended each year, with all seven grades taught by one teacher. School days here started with a devotional song, the Lord’s Prayer, and the Pledge of Allegiance. The teacher taught each of the grades in turn, and some days had trouble getting to all seven classes in a day. For its first 44 years, there were no high schools in the county for graduates of Drayden... In many cases for the early students here, children or grandchildren of former slaves, they were the first generation of their family to learn to read or write. Since it was George Washington's (observed) birthday, we thought it appropriate to jump across the Potomac and pay a visit to George Washington Birthplace National Monument in Westmoreland County, VA for another ziawoods virtual cache, Washington Family Burial Ground (TCEK2) by ziawoods. The family originally settled in 1657 on Bridges Creek. ...[and] acquired additional land located on nearby Popes Creek, and some time before 1718 John Washington, George Washington's great-grandfather, built the first section of the house in which George Washington was born. George’s father enlarged that house between 1722 and 1726. It was further enlarged by the mid-1770s to a ten-room house, known as "Wakefield". But this cache does not take you to the main plantation buildings; instead it takes you to the site of that first cabin and to the family burial grounds. 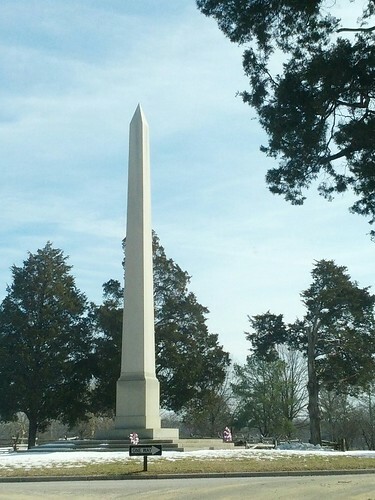 Members of five generations of the Washington family, including George Washington's father, grandfather, and great-grandfather are buried here. In all, thirty-two graves of Washington family members have been found at this Bridges Creek cemetery plot. Replicas of two original gravestones, along with five memorial tablets placed here in the 1930s, may be viewed. I was a little surprised not to see more activity here, today, but maybe they do something on his actual birthday, February 22. After this, we stopped for a few more physical caches and swung by Horne's to pick up some snacks for the road. They're at the intersection of US 17 and US 301 in Port Royal and I always try to stop when going by. We grabbed a couple traditional Groundspeak caches and then stopped to claim a GPSgames Dashpoint - a first for both of us. 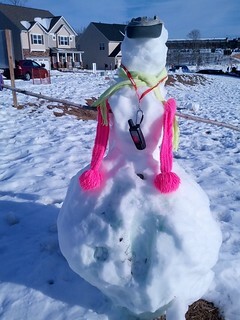 I was even able to claim a TerraCaching Locationless Cache, TCing Snowman (LC74I) by JAYMEDINC, in the same neighborhood. We'd decided to just head home after my meetup with Frosty, but as we were pass Fort Belvoir, we got an alert that SoccerFanatics had placed our GeoPoker cache near my TerraCaching virtual, FortWillard (TCEMJ) that Charlie hadn't found, yet. It was an obvious decision to swing by since it would be a 2-fer for him. 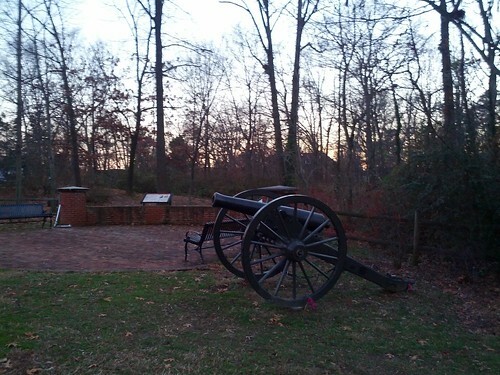 Fort Willard was a Civil War fort constructed in 1862 as part of the Union defense system for Washington, DC. It is now located in the Belle Haven area of Fairfax County. It was the southernmost fort built to defend Washington. The principal features remaining on site consist of earthen fortifications, cannon embrasures or platforms and the remains of a bombproof (bomb shelter) and magazine (arms and gunpowder storage) area. After that, we finally headed straight home to get ready for the work week ahead. Even though, the trip I'd been looking forward to ended up being cancelled (postponed, at least), this weekend included much of what I love about geocaching. I had some solo caching time in the snow on Saturday, a special milestone on Sunday, and a full day of exploring interesting locations on Monday with a good caching friend. You can tell I really like Horne's, since they've made it (with photo) into 2 of the blog posts. In addition to this one, see August 11, 2006. I need to see if I can get a little kickback or, at least, a discount.